As for those scratches mysteriously appearing on the chip after the initial photo, these are much deeper than you have imagined. In order to examine the cross section of the piece for identification of the material, it must be cleanly cut through a good part of the board. They need to make two cuts at right angles to map the orientation of the fibers in the epoxy board. Obviously some of the documentation for this chip is not present or this would have been explained. Now that's making a lot of sense. Looking at Caustic Logic's three pictures last night, I was coming to the conclusion that the most elegant and rational way to explain it all was that it was all the same chip, but it had been defaced/altered by the forensic examination. You are allowed to mess with the evidence. I do forensic post mortem work, and I might as well pack up and go home if nobody will let me cut up the body! The key is first, to photograph everything before you start, and second, to keep all the bits, no matter how dismembered they may be by the time you've finished. I wouldn't expect a layman to know the difference between a stab wound and a cut I made myself, but another pathologist would know. I suspect all this was done, but not all the sequence of photographs, or the explanation, has made it into the public domain. The doubts about the timer fragment in no way depend on the Bollier/Lumpert assertion that the fragment was switched. Lumpert's "confession" actually just makes it all far too complicated. If they really found a fragment in the wreckage, but it was brown (which would not be traceable to Libya), then one might just possible suggest that someone did a switcheroo at some stage with a fabricated green fragment faked up to look like the original brown one. However, suggesting that they (Thurman?) stupidly used the wrong colour of board when constructing the original fabrication, then had to substitute this with another one of the right colour, again faked up to look like the real fake, is a bridge too far for me. There were quite a few of the green boards, and they were known to be traceable to Libya. That's what this is all supposed to be about. Thurman had (at least) one of the green boards, obtained from a Libyan agent. Even Bollier's theory suggests that he got hold of another green one later, to create the second fake. The idea that all he could get his hands on in June 1990 was a brown one that he'd obtained from Lumpert via Fluckiger seems quite far-fetched to me. It doesn't mean the timer fragment couldn't have been planted. But it does mean it didn't have to be. Google is still giving me access to all of chapter 13 and some other pages. Check the Chapter link at the top of the preview page. You might also try clearing any cookies from that Google site and search for the chapter title. I remember from one episode of Mythbusters where they blew something up with high explosives, they discovered part of the detonator. The expert said that it was common to find such parts. Other references to explosive demolition talk about the steel being shattered and not melted[link]. There is the Monrow effect (mentioned in this thread) that causes some melting but not for large objects. Although the detonation temperature is quite high, the contact time is very short (measured in micro-seconds) so there is little heat transfered, For small objects, the object itself is accelerated away from the blast faster than it can be melted by the heat. I thought he was able to get the brown prototypes and the artwork (need to check that to be sure). From that, any number of boards in any color you want could be produced at any time. The MST-13 timer fragment is the perfect plantable evidence. You have a device that you can pinpoint when and where it was manufactured and who it was sold to. With such a limited run, There is no possibility of any other agency identifying the piece until you decide to play it. It could be planted any time as a hole card to be played when the need arises. It's discovery in the debris can be dismissed as just another unidentified foreign object until it is positively identified as a piece of a Libyan timer. Guys, this is what happens when one quotes google and does wiki-chun when they dont know all the ins and outs. Its the details that make the difference. I'm not sure I can make myself any clearer. Perhaps it would be worth while your reading the other commentary sources who have explained why, if any timing device were (perhaps miraculously) to be recovered from this explosion, it would have been expected to be an ice-cube timer connected to an aneroid barometer, set to trigger the bomb 30 minutes after the atmospheric pressure had dropped to 940Mb, and not an MST-13. A barometer is a SWITCH. Its either NO or NC and does whatever when its presseure is reached. Thats all it does- thats all it can do. Thats why it cant be analog from the information claimed. So it would have been possible to have incorporated a barometer if the bombers had wanted to do that? Incorporation of a barometer would solve one problem (timing of the explosion) but create another (point of entry into the baggage handling system). With a barometric switch in series with the relay coil, the device will not trigger until after the preset time AND the device is at altitude. It can be injected into the system anywhere. The greatest risk is if one of the flights is late it could have gone off on the earlier hop but not on the ground. However, if it had a barometer, it's almost inescapable that the device was introduced to the system at Heathrow. Otherwise, it would simply have exploded at the pre-set time after the Air Malta flight left Luqa. A typical barometric switch would reset itself once it dropped below the set altitude. Otherwise there would be no way to test the calibration. OK, I'm sure someone can figure out some way it might be possible to rig a device to remain inert during the first two legs of the flight, and only to be activated after the take-off from Heathrow. A BBC article which seems to be entirely mistaken and operating from a number of wrong premises does postulate a barometric device which can count how many times it has taken off, however such a modus operandi has never been postulated by anyone investigating Lockerbie, and I'm not aware of any record of a terrorist group possessing or using such a device. Possible and actually quite easy. Although it looks like the barometric switch is in series with the relay coil and therefore passively connected to the timer, that configuration can actually provide an input to the timer micro-controller. In the world of micro-controllers, the distinction between input and output is often just a convention for a given usage. There are also programmable replacements for special function chips that are used by the engineers to prototype new designs. From there it is simply a little programming to count the ups and downs. We don't have the actual chips from the timer so there is no way to say for certain what it was programmed to do. But the simple timer with a series pressure switch is sufficient for the task so it's not necessary to speculate about anything more complex. Er, could I draw your attention to the title of the thread? Was the MST-13 timer fragment planted? If you've decided that the MST-13 timer was the timer that triggered the explosion, you've already answered that in the negative. I'm speculating that the MST-13 timer fragment was planted, and something else actually triggered the explosion. Like an ice-cube timer. I'm just commenting that this is a very interesting observation. Come back to it later. That's very helpful. It's similar to something Ambrosia suggested earlier, but what you said makes better sense. Mmm, I understand what you mean now. I've never been able to understand the assumption that there was no barometer involved in this attack. On the evidence which we heard we are satisfied that the explosive device which destroyed PA103 was triggered by an MST-13 timer alone and that neither an ice-cube timer nor any barometric device played any part in it. Obviously there was a timer, and the Court accepted that this was the MST-13. Nobody ever suggested that a barometer was also involved. However, given the non-negligible chance of the flight still being on the ground at 7pm, and the fact that it wasn't schedued to land for another seven hours or so after that, a terrorist wanting to cause an airliner to fall out of the sky would have been very ill-advised to set that timer for 7pm. If on the other hand a barometer was involved, then the 38-minute explosion makes a lot more sense. There would have been no danger of the thing going off on the ground at all. There's still no obvious reason why the Libyans (as opposed to Jibril) would have wanted such an early explosion, scattering bits of evidence all over terra firma (Lockerbie was just blind bad luck) rather than safely in Davy Jones's locker, but at least you've explained it's possible. The question of the timing of the explosion was apparently never raised in court. I'm not quite sure why, because if you're going to lead a special defence of incrimination saying that Jibril's group did it, it seems to me to be one of the strongest inferences in that argument. Oh yes. If it could be proved the fragment was planted, the case would fall apart. There has never been any serious defence attempt to prove that, however. I note that in the original trial, the defence tried to cast doubt on the provenance of the fragment. They drew attention to the altered label, and the apparently interpolated page in Hayes's notes, and the oddity of the polaroid pictures being taken in such apparent haste in September 1989. However, they didn't attempt to draw any of this together to allege straight out that the fragment was planted. This isn't unusual defence behaviour. They don't think like detective stories. They don't really care what actually happened, so long as they can sow sufficient doubt on the assertion that their client did it. They don't have to prove who really did it. They don't even have to prove their client didn't do it. They just have to introduce enough doubt. Even ignoring the suggestions (from Hans Kochler) that the defence team weren't exactly trying their hardest to get Megrahi acquitted, this would probably have been a very risky strategy, especially given that there was no jury. (I suspect juries might be a bit more open to the suggestion that the law enforcement authorities had fabricated evidence than a bunch of judges.) It's a very very serious allegation, they couldn't prove it, and it would probably just have alienated the judges even further. I note that the documents that have been released concerning the second appeal also appear to say the provenance of the fragment is not being challenged. As a result, the narrative of the timer provenance has never really been examined, challenged or tested. It's an interesting exercise. Could it have been planted? Is it at all likely it was planted? If it was planted, when did that actually happen? Who else knew about it and helped cover it up? Who made the decision to plant evidence in the case, and why? I think all of these questions are just as interesting as whether a fragment was brown or green, and whether all the photographs show the same object. I agree I'd definitely have taken one like that with all the elements visible, but I'd also try to get a close-up of the interesting fragment itself. The presence of the circle, apparently drawing attention to which piece is the interesting bit (if it's original), kind of suggests that might not have been done. Also, the narrative always refers to "a" polaroid. It could be because the Polaroid camera didn't have a macro lens and couldn't go in any closer than this. Oh dear. Dammit, how long does it take to scare up a photographer to get this done properly, and then develop the shots? In a place like RAERDE? This is extremely peculiar. It had been lying there for four months, allegedly, since Hayes logged it in May. Would another couple of days make so much difference? I agree the lack of careful documentation here is a little suspect, if far from conclusive. "Polaroid" is too vague to suggest actual camera make - it's like saying "here's a xerox copy." Agreed that the circle hints there were no close-ups taken of the fragment itself, so why the use of plural? Perhaps he sent a separate pic that was just a blow-up of the fragment, re-developed as a separate "photo." This could explain his apology for "quality," as it would look about like the best blow-up we've seen (based on higher resolutions than are freely available). I'm theorising a conspiracy here, between Williams and Thurman, with the active co-operation of Hayes and Feraday, to seed the evidence trail retrospectively with indications that the fragment, actually introduced in June 1990, had been sitting there for a lot longer. You understand I'm not accusing anyone, just trying to see if this hypothesis might fly at all. As I said, that sounds plausible. First ask how many people need be involved. 2-4 is actually nearer the smallest possible number (2) than to the high end, so on that ground at least it can stand as a possibility. As you say, what's going on at the top of the shot? The fragment seems to have lost an appreciable bit of height by the second and third photos, and the shape of the "1" is also different. It looks more like the third than the second picture, so I suppose it could just be a feature of the angle of the light so far as that goes. And what are those extra lines at the bottom right? Not sure, but if you mean the small vertical one between the two trace lines, it's clearer in Thurman's view, even a screen cap, than in the detailed exhibit photo. It's app. rel. to the scoring. Here's another shot I found, shown on 60 Minutes in 1999, app. of Thurman's photo, but closer up. I'm sorry I haven't made myself clear about the ice cube timer. Of course that device is not an ice cube timer. That is the actual point. I am saying the presence of an MST-13 is anomalous because the timing of the explosion (and other pieces of information) would lead one to expect any fragment of timer which miraculously survived to have been an ice-cube device, not an MST-13. However, IF libya were trying to do this, AND trying to hide their guilt (did they ever confess proudly? don't answer), AND were aware one of their agents had already been nabbed in an apparent MST-13 plane bombing attempt, with all the stuff confiscated, they would be damn stupid to use an MST-13 timer to purposefully and precisely set it to blow up right around the Scottish coastline, give or take a bit, when they could just as easily aimed for over the mid-Atlantic ridge. I hope this point is accepted by all here as solid circumstantial grounds for doubt and deeper probing. I note that Feraday is very clear that the item is GREEN, at the time of the polaroids. The Court judgement also implies that Hayes recorded it as being green on that infamous page 51, back in May. However, that's the picture Caustic Logic thinks actually shows a brown board. Bollier and Lumpert both insist that the original planted version was brown. They also say the edges of the cut-out corners were rougher than in the green versions. Well I did kind of say that, but really all I can say is the first photo doesn't look as blue as the others. The color thing is weird, and worth some more thinking with all the views available, in a later post. And the 'rougher edges' claim sounds specious to me. I'm not too concerned by the detail in Bollier's accounts, which picture he thinks he saw first and so on. However, is there any mileage in the claim that the fragment was substituted at some stage? I'm honestly not sure. Well all the photos look the same shape to me anyway, implying careful forgery down to small details, or the same chip throughout, though decapitated, sliced, and possibly photo-tinted for some reason. I will address Dan O. 's valuable points in a little bit. To explain the condition of the fragment, it may have been folded against the body of the relay by the initial blast wave. The relay body would then protect the face of the chip during the blast while the heat rises enough to melt the solder. When the chip releases from the relay leads, the subsequent sudden deceleration upon impact with other objects would dislocate any solder remaining on the pad. Also the possibility this is the reverse side from what was facing the blast, closely shielded by the (9) layers of epoxy and solder, and that it was IIRC shielded inside a metal timer casing, and I'm still not able to buy that its very presence is impossible in the official scenario. As for those scratches mysteriously appearing on the chip after the initial photo, these are much deeper than you have imagined. Actually as I said they seem pretty deep, enough so that in one view (Thurman's) the board seems to bend slightly at the cut. In order to examine the cross section of the piece for identification of the material, it must be cleanly cut through a good part of the board. They need to make two cuts at right angles to map the orientation of the fibers in the epoxy board. Obviously some of the documentation for this chip is not present or this would have been explained. Ah! That would explain the cuts quite well within the "normal" framework. All I knew is I saw cuts I hadn't seen explained, and until I see something else I'm considering them explained. Do you think the same notion could explain the severed top portion? Would they cut clear through it, removing part, to see the full cross-section? And why omit the top portion in later photos, rather than displaying the whole piece of evidence? I looked and it seems chapter 13 is not included in the preview, as it comes up on my computer. Usually they'll skip pages you can't see but still scroll to the end. My view stops entirely at page 369, then "pages omitted" and back cover. Any quotes you can share, cool, nut otherwise I don't plan to get up to speed on accident investigation standards. Rather, I'll just refrain from leaping to unwarranted conclusions. Oh, what does it say about testing for explosives residue? That's probably in 13 too. Are investigators supposed to swab for chemical traces? Are small fragment size (app 1cm sq) or budget restrictions listed as good reasons to skip this? Presuming of course someone is willing to accept the chain of logic making this a "Libyan timer." That they had to mangle or pay for supporting evidence is a troubling sign that someone knew it wouldn't be found naturally, that it wasn't necessarily a Libyan-placed timer, even if it genuinely was in the crash. Last edited by Caustic Logic; 28th September 2009 at 12:29 AM. The photo overlay I did above is meant to show that the solder pad that looks like a "1" doesn't have anything mounted on it. So, if the fragment came from a timer that has a similar design to the populated board pic, with a relay or some other component attached to it, and it was then blown to bits in an explosion, there should be some kind of visible damage to the part of the solder pad where the component was connected? As there is no such damage visible in the photos of the fragment, we can say for sure (as sure as we can be without physically examining the actual fragment and not just pics of it) that the MST-13 fragment did not come from a working bomb timer. It's also worth noting what Lumperts 2007 affidavit actually states. He's flat out saying that the board he stole and gave to the authorities was green, and not brown. But all the prototypes he made (three of them) were brown. Allegedly. The f-ed up colour on all the photos is annoying. I can't see why it's like that, because that picture of the populated board (where did that come from by the way?) shows the green shade absolutely fine. However, I wonder if there's some innocent explanation for that (like fading prints - remember, none of these would have been digital photographs) but maybe it's part of the reason for the Swiss contingent getting their knickers in a twist. I'm leaning towards the explanation that all the pictures show the same fragment, and the differences are attributable to manipulation during forensic analysis. Bollier comes over so off-the-wall that I'm not really inclined to take his word for it that they're different. Are we quite sure there's no such damage visible in the photos? The solder pad is copper, isn't it? So it would be very reflective, and even slight variations in the surface would show up as odd reflective "shapes". I think such variation can be seen in the photographs. I'm just not clear what we would expect to be seeing if the board the fragment came from had definitely been populated. If the component was ripped off, possibly we'd expect the pad itself to be damaged, possibly part of the copper ripped off. However, if the solder was melted off, maybe the damage to the pad would be less appreciable? I see Robert Black has a new blog article up today, still majoring on whether or not the timer fragment could have survived the explosion at all. Apparently the MSPs are going to get to see Lockerbie Revisited tomorrow. I imagine they'll get a subtitled (or voice-over translation) for the Dutch bits, so it should be easier for them to follow. I wish such a version was available on-line. It appears that we have a bunch of people in the early 1990s who assumed it would be possible for such a fragment to survive. (Maybe some tests were done, but it's not at all clear that any of the tests were set up to check on survivability of the timer circuit board.) Now we have a number of people in 2009 who are declaring that the thing should have been vaporised. It should be possible to check that even at this late date, however that would need a bit of political will which appears to be lacking. My problem with this line is that it seems to cast doubt not only on the nature of the timing device used, but on the entire "bomb suitcase" theory. We must remember that the Toshiba was also identified by a bit of its circuit board which had survived, and quite a number of other bits of the radio-cassette were found on the ground. 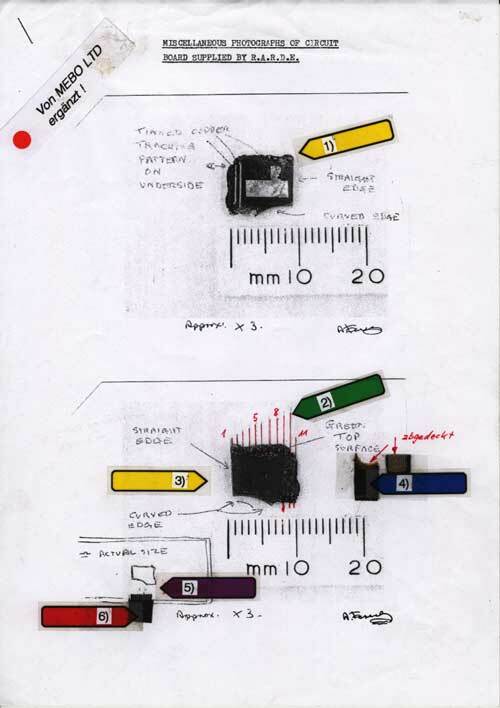 The presence of bits of Toshiba was used as one of the ways to clarify whether a particular piece of fabric had been in the bomb suitcase or not. It's very much more difficult to explain away the bits of Toshiba, or suggest they were fabricated. If one suggests that, the entire case starts to spin out of control. The Toshiba bomb, the clothes bought at Gauci's shop, the brown Samsonite suitcase - all these were based on very early findings before any rational suspicion of manipulation of the evidence can surely be suggested. And while they may be mistaken interpretations of genuine findings, again that's difficult to sustain. Then again, the people who are postulating that the timer fragment wouldn't have survived are also postulating that the crash was due to a placed charge in the actual hull of the plane. I find this very difficult to sustain. The first piece of blast-damaged luggage container was found three days after the crash. The reconstruction of the area of the explosion provides very strong evidence that the explosion happened inside luggage container AVE 4041. That this could all have been fabricated seems highly implausible to me. So if the timer fragment couldn't have survived, does that mean the fragments of circuit board from the Toshiba couldn't have survived either? If it does, then we're back on that other thread, which I find altogether wierder territory. I'd love to know what the MSPs think of the Dutch film though. It doesn't prove the fragment was planted, but it does cast so much doubt on its provenance (especially as regards the disagreement concerning whether it was ever taken the the USA) that the whole thing gets very murky. I see Robert Black has a new blog article up today, still majoring on whether or not the timer fragment could have survived the explosion at all. ..snip.. It appears that we have a bunch of people in the early 1990s who assumed it would be possible for such a fragment to survive. (Maybe some tests were done, but it's not at all clear that any of the tests were set up to check on survivability of the timer circuit board.) Now we have a number of people in 2009 who are declaring that the thing should have been vaporised. That blog article is woeful, it's getting to truther level, with the 'throwing down the gauntlet' rubbish. The group of people claiming the circuit should have been vapourised in 2009 are an odd bunch as well. The challenge to the evidence has been emboldened by confirmation from semtex manufacturer Miroslav Štancl of Explosia a.s, who says the temperature at the point of explosion of “plastic explosives Semtex” is between 3,800 and 3,870° C, depending upon the type and composition. Aitken Brotherston, who tested circuit boards as an engineer at Ferranti says that such boards will combust at temperatures equivalent to that produced by a Swan Vesta match, and “nothing would survive” within a semtex blast bright spot. So the manufacturer of Semtex claims it is hot when it explodes, I don't think this was ever disputed, and indeed is confirmed in the book Dan O referenced earlier. This seems to be unarguable. That would be Ferranti who used to have a factory on the M8 just outside Edinburgh, before they went bust in 1993. I don't suppose Aitken Brotherton met Robert Black down the pub did he? Given the amount of Semtex explosions investigated in the UK from ~1970 -1999 there should be dozens of investigators and scientists popping up to say nothing can survive close to the explosion, not just random blokes who used to be test technicians 15 + years ago. The problem with Black's blog is that he re-posts stuff from anywhere and everywhere that's relevant to the Lockerbie case, as it comes out, without much or any comment of his own. He posted a rant by Kelvin McKenzie earlier in the month. I have no idea if he personally takes this suggestion seriously. That's close to what I was thinking. Nobody is in any doubt about the temperature experienced when Semtex detonates. The question, as raised in an earlier post here, is for how long would the timer circuitry be exposed to that temperature? If it was blasted away from the explosion very fast, could a fragment not conceivably survive? In the same way as, presumably, fragments of circuitry and casing from the Toshiba survived? I'd be awfully surprised (given the amount of experience with IRA devices, as you say) if the investigators in the 1990s made such a hideous boo-boo here. I also find the other evidence that the explosion took place in the baggage container to be very persuasive. I don't know why the "placed charge" brigade are ignoring that. Last edited by Rolfe; 28th September 2009 at 06:58 AM. Another very recent article worth a look is by Gareth Pierce. This isn't her jurisdiction, but it's the sort of case she has become well-known for defending in England. She's passionate about what she does, but nobody has ever accused her of being an incompetent lawyer. She seems to me to be a relatively recent player in this case, but to be catching up fast. She's summarising the whole it-was-the-PFLP-no-it-wasn't circumstance, and highlighting all the shenanigans with US involvement in the initial search operation. She doesn't seem to be questioning the provenance of the timer, though she has yet a different take on that aspect, which I suspect might be partially misunderstanding. This suggestion is possibly getting back to that BBC article I thought was essentially misunderstanding - the one which suggested the barometric device had been triggered on the PA103A leg from Frankfurt, and the detonation over land was not intended, but was due to PA103 being slightly delayed at Heathrow. To which the question was asked, if you can get a barometric device to count, then surely it can count up to three? However, it's not saying exactly that, it's suggesting that the MST-13, if used by Jibril's group instead of the ice-cube, would make their devices far more versatile in that they wouldn't have to be loaded at the last airport before the detonation, but could be introduced earlier in the chain. This is pretty much what Dan O was saying too. It's still not fool-proof, because it still needs the bag to escape x-ray detection more than once, and if the bag was still airborne on the previous leg by the time it ought to be taking off at Heathrow, it would detonate prematurely. However, it's a lot better than simply trusting that the plane won't be delayed by an hour. If the timer fragment wasn't planted, that seems to me to be the most likely explanation of what it was doing there. One of Jibril's group was reported as saying "they'll never find out how I did it." Could be that the mysterious "how" was that they'd got hold of a timer which would allow the bomb bag to be loaded via a feeder flight. Which means that we have no idea what was going on with the brown Samsonite suitcase seen at Heathrow before the feeder flight landed. But this was never going to be simple. Last edited by Rolfe; 28th September 2009 at 08:31 AM. That's what I was presuming. Since the display and controls are protruding through the board, the timer would then need to be programed and activated before it is placed in the radio with the explosives. This is probably the safest way since a noisy sliding power switch could lead to a logic glitch and one less wannabe terrorist. If there was a casing for the timer, I would expect it to be molded plastic and not metal. For a metal casing you want mounting points for the standoff supports such as the 4 holes in the corners that had been removed on the board that the fragment was from. Also, metal would show up as out of place in the radio whereas circuits, batteries and wires look like they belong. A forensic examiner should know that the shape of that pad is key to identifying the piece and not to destroy or alter that information. But it does look like that is what happened. Google's goal is to show you what you are looking for but they are restricted by copyright to showing you only excerpts. It may not be reasonable for Google to keep a vast database of every book excerpt they showed to each user. But they could keep that information in a cookie so once you look at a book your view is fixed. if that's what they are doing, you need only find and remove that cookie to get a new view. As I've heard, the circuit fragment was discovered wrapped in a piece of cloth that tested positive for explosives. The fragment is therefore going to test positive whether or not it was planted there because it would pick up traces from the cloth. I don't know what role Libya had in designing the timer. I suspect that mebo had a general product line with that dimension including the display and micro-controller that could be developed into many products including counters and timers. This would spread the major costs of producing the dies for cutting the board and molding the cases (you can find such product line similarities with many small manufacturers). Did Libya actually commission any part of the timer design or did they just purchase an existing product? I don't necessarily put much credence on what the MeBo people have said, but they did state that it would have been impossible to get the timer inside the Toshiba with its case, and it would have had to be taken out of the case to build the bomb. Thanks for that piece of information, it makes perfect sense. If it's that simple, then why didn't the investigators just say so? We've been told the fragment was too small (but we know they tested smaller objects, and we've been told (loudly, in Lockerbie Revisited) that it was due to budgetary constraints, but nobody said anything remotely sensible likw that. Back to MeBo, and is their evidence reliable, but it does appear that these timers were commissioned by Libya. 3) During spring or during begin of summer (so far it has been impossible to get the exact date), the co-owner of the company MEBO AG, Edwin Bollier, gave me task to develop a timer device, later labelled type MST-13. Edwin Bollier added the specifications. 4) At this point of time, I did not knew for what and for whom this development was prepared for. 5) After I had drawn the blueprint, as well as built up the laboratory test device, I prepared a "blueprint-draft" for a future manufacturing PC-board production-film. 6) This first PC-board-film was fabricated by the Firm BUSAG in Zurich. 7) With this first PC-board-film, prepared by BUSAG, I handmade the first 3 pieces of prototypes MST-13 PC-boards. These 3 PC-boards were corrodet in an acid-solution in the laboratory of MEBO AG. In this way the copper tracks did not come out perfect, compared to the later machine manufactured pieces from the firm Thuring. The copper tracks were soldered by me with a soldering iron using tin solder. Also, the soldering of the lead tracks were far from perfect and were irregular, compared to the later machine manufactured PC-borads from the firm Thuring. These PC-boards contained no soldering sealing wax and the color was light brown. 13) When I had corrected the erroneous blueprint, a second production-film was prepared, used to order 20 pieces of MST-13 PC-borads from the firm Thuring on August 13, 1985, all without any soldering sealing wax. These PC-boards were manufactured by machine, containing green coating on the front, due to the green enamel. All ordered PC-boards from Thuring were 0.4 mm larger than the first 3 handmade MST-13 prototype PC-boards. It seems fairly clear that these things were commissioned by someone, almost certainly Libya, and Lumpert designed them to order. However, he had the pieces the were delivered to Libya manufactured out-of-house, by Thuring. I imagine the possibility that this is something else from Thuring's factory, which just happens to have a corner the same as the MST-13 has been checked out? Last edited by Rolfe; 28th September 2009 at 11:21 AM. I'm not impressed by Bollier - he comes across pretty wild-eyed, and his web site is ridiculous. I don't give much credence to this green board/brown board thing, or his comments about the solder. I can't see why it shouldn't have been the same fragment every time it was shown, now you've explained the cuts/scratches satisfactorily. I was wondering when any fabricated chip might have been introduced into the system. Longtabber also suggested that it might have just been introduced at one point then left for investigators to find and draw conclusions from. However, I find this less easy to make sense of when considering the who, the how, the when and the why of it all. The timeline goes like this. 21st December 1988: PA103 crashes. 13th January 1989: Date given for the recovery of the piece of collar from the landscape. 17th January 1989: Piece of collar logged into the property store. 12th May 1989: Date of the extra "page 51" in which Hayes records his examination of this item, apparently noting the presence of the fragment but not apparently believing it to be of significance. 15th September 1989: Feraday sends the rushed polaroids of the fragment to Williamson. June 1990: Thurman contacts Williamson to say he thinks he can identify the fragment. Williamson and Feraday go Washington to look at Thurman's intact timer, which had been recovered from an arms cache. November 1990: Williamson visits MeBo in Switzerland. As far as the first point goes, I've been wondering where any planted fragment might have been obtained. I can't quite remember where I read this, but the MST-13 Thurman matched the fragment to had apparently been in the possession of the US authorities since 1986, not long after Libya acquired them. Two were found in an arms cache, I think in Sudan or somewhere, and the finders called in the USA because they looked modern and new compared to the rest of the material in the cache. The US authorities asked if they could keep one. They were not given them both according to the source I read, and the fate of the other was not recorded. Assuming this is true, where might the material have come from to manufacture a planted fragment? If they weren't given the second piece, did they get another from another source? Or would it have been easy to make a fake fragment using other materials? So that it would stand forensic examination by people not necessarily in the plot? Dan O, do you think it would have been a practical proposition to manufacture the fragment from the resources to hand? I know I'm not Dan O. , but I'll chuck my opinion in anyway. I think this would be an extremely risky thing to do. Unless you could get pcb board from the same source, and preferably the same batch as the MeBo timers, you are risking that a forensic examination would throw up an irreconcilable difference, which would expose the plant. This would be on top of the difficulties of producing an exact match for the shape, without having a sample to work from, with suitable explosion damage. On top of this, the biggest risk of the evidence plant is that during the inspection of the 4 million bits of wreckage, someone turns up a piece of the real timer, which for the sake of argument is identifiable as something traceable to Iran, what do you do with the Libyan timer then? Last edited by Guybrush Threepwood; 28th September 2009 at 02:35 PM. It was in a video, Bollier holding a silver/gray case that was, as you say, probably plastic. Okay. It would add to the protection some, it's not as if the board was pressecd right into the pat of semtex. I did see a discussion where the Libyans were haggling over the price of a certain model, Olympus or something, so I think they were buying pre-made MEBO set-ups, at one point. In short, I dunno. I'm a little slow catching up over here, still kind of busy with other stuff but I'm on it. I see Robert Black has a new blog article up today, still majoring on whether or not the timer fragment could have survived the explosion at all. Wow. According to the comments section, Richard Marquise himself is posting comments on it. Apparently the MSPs are going to get to see Lockerbie Revisited tomorrow. I imagine they'll get a subtitled (or voice-over translation) for the Dutch bits, so it should be easier for them to follow. I wish such a version was available on-line. This is good. It will have to raise questions and likely bring some more viewers to this thread too. I'm not that sure it would be so risky as such. What is giving me pause is that the narrative doesn't work. Is it likely the fragment was planted, and if so, when did it happen? That's the difficulty. Although the US authorities had the intact timer from about 1986, and I think knew it was of Libyan origin, they didn't know where it came from, who manufactured it and how many there were. Allegedly. That had to be figured out in the latter half of 1990. So at what point was it decided this was an appropriate thing to plant in the evidence? First, it's hard to believe a plant of that nature was dreamed up at the British end. Bush was always the leading player, with Thatcher going along. If anybody in either of the security forces decided to plant it, I can't see it being other than the US side. So when did they do it? The temptation is to suspect June 1990, when Wiliamson and Feraday went to Washington to look at the intact timer Thurman had discovered. The implication is that a photograph had been sent to Thurman, to see if he could identify it, and that he matched the photograph with the extant timer. If we were looking at a plant, that would be the point. It would explain the disagreement about whether the fragment was taken to the US or not. Did it in fact originate there? Was it introduced at that point? A conspiracy isn't all that far-fetched, because these people had been working together, and the US agencies had been pressurising the Scottish police from day 1 anyway. A CIA decision that something had to be faked could have been implemented. And even if a fake fragment turned out not to be a perfect match later, the worst that would happen, realistically would be, damn, it's not one of these after all. It would explain the alteration of the original evidence label, possibly, and the extra page 51 - it was just added at that point. It could even explain the polaroid. I mean, why wait four months then suddenly say you don't have time to take a proper photograph? Why not just wait another couple of days to get one done? Well, if none of that actually happened at that time, then it would be a reason to introduce a poor-quality photograph which was actually faked up at a later date, but was sufficiently fuzzy that this wouldn't be remarked on. All this dreamed up in June 1990, and evidence carefully seeded to account for the fragment's presence right back to within three weeks of the crash. The problem is, it doesn't fly. Even if the polaroids were faked up as I just suggested, they're not the only evidence of the presence of the fragment before June 1990. Between September 1989 and June 1990, Williamson is said to have cast a wide net around circuit board manufacturers trying to find out where it came from. Is it really likely he did no such thing and that's a fabrication too? It gets more and more unlikely the more detail you try to reconcile. I can't see any planting happening in September 1989. At that time the narrative has the thing in England, and I don't think a plan like this originated in England. Even if the US authorities had decided to do that, somehow got the thing insinuated at RAERDE with the help of a co-operative investigator like Feraday, and set Williamson off to see what he could find, the timing at that point is too early. It's not easy to see why anyone should want, in the autumn of 1989, to embark on a complicated deception to involve Libya. It's possible, I suppose, and then when Williamson wasn't getting anywhere by June, the trigger was pulled from the US end and they "found" the matching fragment, but it's all implausible and lacking in verisimilitude. In contrast the Official Version does have a relative ring of truth. If we ignore the oddities like the altered label, the extra page in the notes and the fuzzy polaroid, it reads plausibly. Piece of shirt found, but not immediately examined. Then it is examined, but the significance of the find isn't appreciated to the point that it isn't even photographed. Four months later, another researcher spots that it might be important, and in haste to advance the investigation, sends poor-quality pictures to Scotland. Scottish police spend nine months trying fruitlessly to identify it in Europe, and finally send a picture to the FBI just in case the US operation might recognise it. US researcher does indeed recognise it, but doesn't know where it came from. Another five months go by before the manufacturer is definitely identified, and interviewed. I always felt ther was little point in declaring the fragment had to have been planted, unless it was possible to construct a convincing narrative to allow the planting to happen. I have to say I'm struggling to make it sound likely, in contrast to the official version, which sounds relatively natural. So I don't know, but I'm not convincing myself at the moment. It would be standard practice for the PC board production to be outsourced. Very few manufacturers make their own boards in house. Unless Thuring had some standard templates for board shapes and cutouts, these boards would be individually milled to the specifications produced at MEBO. Thuring would however provide the stock copper plated epoxy board (probably also made elsewhere) that would be a standard size to fit their processing equipment (about 16" x 22" is one standard). The pattern would all be MEBO's design but there could be indicators of the design tool they were using (like how the type faces and kerning can help identify the word processor used to create a document). We are told that Thuring produced the boards but it is not clear if they did the cutting and milling of the boards or who added and soldered the chips. Also, if a 16"x22" board is cut into 6x6cm squares you get over 50 timer boards. If 20 went to Libya, and some went to Germany, there could be several more out there waiting to show up on e-Bay. Did the defense try for this argument? If so, it's indeed foolish to ignore this excellent circumstantial evidence. Serves better to make the whole coverup run smoother than to get their client off. Who were the defense team anyway and who selected them? Because they seem to have done a very poor job. Ah, that partly answers my question. I hope after this they learned judges don't operate, like internet audiences, by piling up coincidences and implying some vague doubt without a specific charge. Unless of course the string of too many coincidence leans towards the outcome they want (a conviction in this case). it would probably just have alienated the judges even further. Somehow I agree, even though judges aren't supposed to become alienated from justice and closer to a desire to lock these lying bastards up. Coould, of course. Likely, I think so considering the other evidence points away from Libyans with bad timing. It was probably either planted in the bomb to implicate Libya, or in the evidence collection for the same end. In the former case it would be the placers of the bomb, either some PFLPGC types, or someone framing them, as framing Libya In the latter case, well I don't feel like naming names until I've learned more. Someone who speaks English most likely. I think they're more interesting, but I love working with pictures, and can come to some concrete conclusions, at least about the photos as available to us, FWIW, with not too much investigation. So I will come back to the color issue, while I think we've covered the shape aspect enough. Gilchrist, Scottish Police during a *visit to Zurich in June 1991. 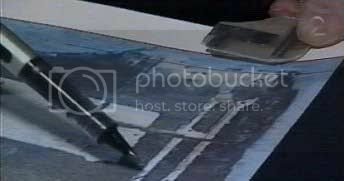 I clearly recognize the scratched remnants of the soldering tracts on this enlarged digital police photograph. There is evidence that the fragment that the police claim was found at Lockerbie was planted. Lumperts affidavit. If he gave it to police in June 89 then it is impossible for it to have been found in the shirt in May 1989. Lumpert designed the board and manufactured it. If there is anyone who ought to know the intimate details of what this board loks like it's Lumpert. If MST-13 was a genuine find Lumpert is lying. What possible reason does he have to lie about this in 2007? To me this is just as hard a thing for the official story to explain as to how the fragment might havebeen planted and by whom. Lets see if we can speculate as to a convincing narrative that explains the fragment being planted. early 89 and the information leaking out of the investigation is "We know who did it, we are pretty sure how they did it, we just need to find the evidence that proves it, and it's pointing towards the PFLP-GC"
Because of the sensitive nature of politics in Beruit Lebanon, with the IranAir Vincennes shooting down recent painful history and other complications like The Satanic Verses, Thatcher "low keys" the Lockerbie investigation and blocks independant enquiries into the disaster. They don't have any proof yet of anything, and jumping the gun could have bad consequences in the middle East later down the road. On top of that the authorities know that Khreesat is a Jordanian intelligence asset with links to the CIA and they let him go. If it turns out that it was Jibril/Khreesat thats a major faux pas. Giaka is known to the CIA, and is feeding them snippets ofhalf truths and lies about this and that in order to get plastic surgery to chicken out of National Service and also to make himself some easy money. He tells agents that he has no information on Megrahi and that there is no way the suitcase could have made it on at Luqa. June 89 Lumpert gives the police a complete MST-13 board. US authorities have an MST-13 board of the same manufacture that they know will tie Libya to Lockerbie, lets assume that it was a US person that Lumpert gave this board to in 89. Someone engineers the fragment, leaving enough of it to enable later identification, and plants it within the evidence. Scottish police try to identify it for several months but draw a blank. During this time it becomes clear to investigators that there is no more evidence that would contradict the fragment, such as a n other timer device being found. The fragment is finally "identified" in June 1990 by an honest but duped Thurman. June 91 Lumpert hands more stuff re MST-13 to police. July 91 CIA threaten Giaka into telling them what they want to hear. He tells them what they want to hear, indictments are issued not long after, and the police are pretty sure that Libya is never going to give up the men, it'll never go to trial. If the fragment was not found and was planted whoeever examined the shirt to find the circuit inside is lying. That would be Feraday. But only about the dates. It's likely given the "not enough time to take photos" line that the shirt wasn't examined until September 89. For all he knows the fragment is genuine. Sometime between June 89 and September 89 someone plants the fragment. All it takes is several people, a high up person to order the planting and to lean on Feraday to cook his notes. Feraday himself and whoever did the actual planting. There's also the "Golfer" Scottish police whistleblower who claims to have participated in fabricating this evidence. Lumpert is lying along with the "Golfer", or Feraday is lying. But why go after Libya at all? ii) They think it's a "safe" place to pin blame as Libya will never ever in a million years allow their people to stand trial. They are CYAing cos they let the real bomb maker go free and are partially responsible. Or there is some other political reason circa late 89 that we don't know about that behooves them to blame anyone but Iran. ETA: possible political reasoning being the shutting down of the Straight of Hormuz by Iranian military that would cause a huge increase in the worlds price of oil and tanking world economies like the USA that depend on oil imports. Last edited by Ambrosia; 29th September 2009 at 01:00 AM. Interesting post Ambrosia, and you make a good argument but I'm still struggling to convince myself that the timer was a plant. There are two main obstacles in my mind. 1. Why bother? If the powers that be don't want to blame Iran/ the PFLP-GC or whoever, then the easiest, most risk free way is not to find any evidence pointing to them, and leave the case unsolved. There would have been grumblings from the families and perhaps some stories in the newspapers, but if you remove the timer, and don't pressure Giaka to name Megrahi, then there is really no evidence pointing to anyone. Case closed with no risk of it blowing up in the governments face. 2. It's a very poor piece of evidence. It could be blown apart in so many ways. E.g. Records emerge from MeBo showing they sold two timers to an Iranian group. Unless the planters have a very high level of certainty that they know the full history of these timers, which even MeBo don't seem to know, then many other countries apart from Libya could have had access. If you are going to plant evidence, it should be convincing evidence, which you know cannot be contradicted. In mid 1989 the MST-13 timer was neither of these things. Last edited by Guybrush Threepwood; 29th September 2009 at 03:00 AM. I only know that I see no reference to the coincidence of the timing in the court judgement. As to the selection of the defence team, that's a can of worms I don't have all the details of. Certainly, Kochler's report on the first appeal is severely critical of the defence strategy, and goes back to criticise in retrospect the defence at the actual trial. I know Megrahi didn't get to choose his lawyers, and at one point one of the original defence team left the case, at which stage some key elements of the defence were apparently abandoned. Kochler praises the defence for having destroyed Giaka's credibility, but then slates them for blatant failure to make a number of arguments that would have assisted their client. I don't honestly know what the full story is, but it isn't necessarily pretty. 9. One of the most serious shortcomings of the appeal proceedings (as of the trial proceedings) was that the appellant did not have adequate defense – a circumstance that weighs heavily in an adversarial judicial system where the fairness of the trial depends mainly on the equality of arms between prosecution and defense. Because of this situation, the requirements of Art. 6 (“Right to a fair trial”) of the European Convention for the Protection of Human Rights and Fundamental Freedoms were not met. 24. In addition to that, the appellant was deprived of his right to adequate legal representation (in the many respects described above in regard to the conduct of the appeal proceedings on the part of the defense team). Furthermore, he did not have the possibility of choosing the defense team on his own. The team was chosen for him by the former Libyan defense lawyer, Mr. Maghour, who at the same time was acting as Libya’s representative in the cases Libyan Arab Jamahiriya v. United Kingdom and Libyan Arab Jamahiriya v. United States respectively at the International Court of Justice. The official role of the Libyan defense lawyer as agent of the Libyan state was incompatible with his duty to give adequate legal assistance to his client in a case of personal criminal responsibility such as the one before the Scottish Court in the Netherlands. In view of the Defense’s decision not to make use of many of the means available to it for the adequate defense of the appellant, the original choice of the defense team (made without the participation of the appellant) may have negatively impacted on the rights of the appellant. That the defense team was “out of tune” with the appellant – whom it was supposed to represent – became clear in the rather strange fact that the Defense refused to meet with the undersigned or to answer any of his questions, while the appellant, through the prison administration and the Scottish Court Service, asked for a meeting with the undersigned. 25. In the meeting of 12 February 2002, requested by the appellant, he disclosed to the undersigned that he was made aware of only 3 out of 16 joint minutes agreed upon by the Prosecution and the Defense in the course of the trial. He also stated that his instructions were not always followed by the Defense (as for instance in the case of the x-ray machine which the appellant had asked to have brought into the courtroom for inspection) and that he did not give instructions to the Defense to drop the “special defense” during the trial (see Par. 9 of the undersigned’s report of 3 February 2001); he further said that he did not understand why no submission of “no case to answer” was made in his case by the Defense (while they made such a step in regard to the co-accused), etc. All of these details underline the basic fact that the appellant did not get adequate legal representation and suggest that the defense strategy may not have been genuine and authentic (as required under European standards). The suspicions raised by the undersigned in his trial report were confirmed by the information obtained during the aforementioned meeting with the appellant. There's more where that came from, but I don't want to quote too much of the document. There is evidence that the fragment that the police claim was found at Lockerbie was planted. Lumperts affidavit. If he gave it to police in June 89 then it is impossible for it to have been found in the shirt in May 1989. Technically, at least, it's evidence. But being given years later, once it could be known that a June handover would moot a May "discovery," from an employee of a company known for rather wiggly nehavior AND openly trying to cash in on destorying the state's case, and it's evidence I wouldn't rest much on. IMO. Lumpert designed the board and manufactured it. If there is anyone who ought to know the intimate details of what this board loks like it's Lumpert. If MST-13 was a genuine find Lumpert is lying. What possible reason does he have to lie about this in 2007? To me this is just as hard a thing for the official story to explain as to how the fragment might havebeen planted and by whom. Where did I just see it seems Mebo is/was trying to open perjury hearings against Lumpert, meaning challenging the Swiss gov. to prove Lumpert's 2007 affidavit is true and he's therefore guilty of perjury in the trial. Clever move, but I didn't hear anything about them finding Lumpert guilty of this serious crime. I do think this is still grounds for added suspicion, even if notihing from Mebo is a real, direct clue. So much weird behavior to me just indicates something amiss. That's a plus for this kind of thinking is at least one person is just following evidence presented to him - most will have to, unless someone can keep tight enough control that the wrong person doesn't mess it all up. it is still odd that an honest non-expert was selected by whatever fates to be the guy. So many variables involved in determining why it came out that way, but mostly I'd guess down the "who he knows' line. It could just be how things work sometimes. ?? For all I know they had a stock of 50 fabricated MST-13s at hand to hack up and practice with, with all the colors available and rudimentary photo-tinting abilities too. Something tells me a bribe modification would do better with this one, but maybe some stick with the carrot. That's an interesting thought, that they didn't think it would actually get to court. The sanctions and all, and gathering evidence, usually points there, but this was an "unsafe" case, good enough for an indictment, some political drama, but not conviction against an adequate defense and such. Maybe Gaddafi meant to call the bluff and knock the whole thing over more than anything handing them over! But as awkward as it was the ballet commenced and knocked back with brute force. And now the later critiques are coming in and its set to tilt right back to PFLPGC/Iran with some help some Spielberg et al. If the fragment was not found and was planted whoeever examined the shirt to find the circuit inside is lying. That would be Feraday. <snip> lean on Feraday to cook his notes. It's Hayes that found the fragment, perhaps took the later picture, and had the badly kept notes. Did Faraday also do all these, or is this a mix-up? There's also the "Golfer" Scottish police whistleblower who claims to have participated in fabricating this evidence. Did this "golfer" guy ever specify how he knows or believes that clothes and timer fragment were planted? From what I recall skimming over, he's too vague to put side-by-side with the specific claims of others. He also does seem to know a lot, including about missing interviews and who is or isn't an undercover CIA drug-runner. I'd like to hear more from this gent when he's ready. AND HEY! A cool new find for me that turned up way down the Google image search road, apparently some technical report (=partially typed on graph paper??) from Mebo around 2005. Has some interesting stuff in it, the best blow-up view yet of the 9/12(?) Hayes/Faraday(?) photo, and what I think is a view of the other side! (black/dark, no features) along with notes by Faraday I think. View. Originally Posted by Bollier "truther mode"
Last edited by Caustic Logic; 29th September 2009 at 03:08 AM. 1. Why bother? If the powers that be don't want to blame Iran/ the PFLP-GC or whoever, then the easiest, most risk free way is not to find any evidence pointing to them, and leave the case unsolved. 2. It's a very poor piece of evidence. It is a piece of evidence though. Physical Evidence is *very* thin on the ground. Perhaps the planter considered it to be strong enough, it remains the only piece of bomb recovered. It wasn't identified formally until June 1990. In January 1989 Bollier delivers to the US Embassy in Vienna a letter offering information that links Libya MEBO and Lockerbie. Apparently this was never followed up until after the fragment was identified. E.g. Records emerge from MeBo showing they sold two timers to an Iranian group. That happened. Records emerged from MeBo showing they sold two timers to the STASI. The verdict notes that "The initial order placed with Thuring was for twenty circuit boards, solder masked on one side only, i.e. single sided. In fact Thuring supplied twenty-four such boards. In October 1985 MEBO placed a further order with Thuring for circuit boards but it was specified that they should be solder masked on both sides, i.e. double sided. Thirty-five such boards were ordered, but Thuring supplied only thirtyfour." Thats 58 MST-13 type boards manufactured plus 3 prototypes hand made by Lumpert. 61 total. 20 are supplied to Libya. About 12 are picked up by police, 2 more are recovered in Togo, another is recovered in Dakar. That leaves more than 20 MST-13 circuit boards out there somewhere. I agree that it's a poor piece of evidence. Was enough to convict Megrahi with though. Yes, mixup, my mistake. My post should read "Hayes" instead of "Feraday"
Interesting post Ambrosia, and you make a good argument but I'm still struggling to convince myself thet the timer was a plant. There are two main obstacles in my mind. This is pretty much the difficulty I'm having with the scenario. I can't get over the huge feeling that the timer fragment shouldn't be there, and in fact I formed that opinion before I'd read more than the vaguest hints that the provenance might not be completely free of doubt. Then I look at the anomalies in the evidence trail. The altered label on the original exhibit. The extra page 51 in Hayes's notes. The rushed and low-detail polaroid pictures. The serious question marks over the professional competence and even integrity of Hayes, Feraday and Thurman. Then I look at the significant number of people who are maintaining that the fragment was planted. And I wonders. Yesssss, I wondersssss. It's the deciding to do it (which must have been at a high level, if it was a strategic decision), planning to do it, creating the manufactured fragment, and implementing the plan I baulk at a bit. If it was done, the decision must have been a US one. I can't believe UK intelligence or law enforcement would have taken that sort of initiative unilaterally, given the subservient role being played to the US in this affair. Also, there's no evidence anyone in Britain had the first idea what an MST-13 was and which country possessed them - that information was on the US side. Given that, I can't believe they would then have simply instructed a couple of British forensics people (Hayes and Feraday) to do it. They would use their own people - if a fragment was constructed, it would have happened in the USA. I could imagine US operatives showing up with the fragment and instructing Hayes and Feraday to introduce it into the evidence trail, but they'd have had to be very sure that these guys would go along with it, rather than go screaming to the papers that US agents had asked them to plant evidence in the Lockerbie enquiry. Where would they have got the material to make a fake fragment from? I don't trust Lumpert, but that's one possibility. Another is that they had another board recovered from the field. A third is Thuring. Was the MST-13 a rational choice? I'd have said yes, on that one. They had one recovered from the field in 1986. It's perfectly possible they knew these were unusual devices specifically traceable to Libya, even if they didn't know exactly where Libya had got them. If they wanted to implicate Libya, it would have been a smart move. When might this have been done? I think a lot of commentary has majored on the fact that the direction of the enquiry shifted in the early autumn of 1990, after Saddam Hussein had invaded Kuwait and while Desert Storm was cooking up. This seems extraordinarily convenient. Too convenient, even. However, it's difficult to pinpoint the actual introduction of the fragment to that date. While it's possible it was planted in June 1990, the point when Thurman contacted Williamson to say he thought he knew what the fragment was, that would require the story that Williamson had been trying for months to identify the manufacturer, contacting many circuit board manufacturers in Europe in that time, to be fabricated. So it's not impossible, I'm just having trouble seeing it as likely. It's not in quite the same league as believing the Twin Towers were quietly wired one Sunday morning with demolition charges nobody could see, but it's not as simple as just saying "OMG it's a plant!" I don't think you can deduce from those photos that these are not the same chip. It is a shame that the original wasn't better documented before they proceeded to destroy it in the name of forensic science. The claim of the scratched letter M may not in fact be a scratch cutting into the surface but simply a fiber laying on top. Under the "M" is an area that appears to have been cleaned revealing a much lighter color below the surface contamination. If this fragment was from the prototype board, I would not expect to see the traces silvered (unless I missed the part where Lumpert plated the prototype boards after the acid etching). I also don't see remains of solder flux that would be left behind after hand soldering though I admit never having tried using semtex to clean a PC board.